Years ago, I read “God’s Debris” by Scott Adams and I was completely blown away because of its amazing (fictional) theories. I loved it so much that it still has me thinking even after all these years. It’s no wonder that the sequel to “God’s Debris” was on my to-read list. Did I think “The Religion War” was just as good? Find out below! In this frenetically paced sequel to Adams’ best-selling ”thought experiment,” God’s Debris, the smartest man in the world is on a mission to stop a cataclysmic war. A war between Christian and Muslim forces and save civilization. The brilliantly crafted, thought-provoking fable raises questions about the nature of reality and just where our delusions are taking us. Unlike God’s Debris, which was principally a dialogue between its two main characters, The Religion War is set several decades in the future. The smartest man in the world steps between international leaders to prevent a catastrophic confrontation between Christianity and Islam. The parallels between where we are today and where we could be in the near future are clear. The Religion War starts interesting right away! The student has become the master. It is not long before logical reasoning and big questions enter the book. This was promising. In a considerably nearby future, the world is divided into two worlds. These worlds are the Muslim world and the Christian world. The Christian world also includes every other religious group such as Jews, Hindu’s and small religious groups. A great war is about to break out and the Avatar (the former package delivery guy) attempts to prevent the war, because he feels like it is his responsibility. Due to inter alia his cold reading skills, he manages to speak to all the important leaders of both sides. Moreover, he goes on a quest to find the one person that can influence the entire world, because that person will be able to prevent the war. All the while, the Avatar analyses the patterns around him, leading him to brilliant solutions for any situation, or any person he speaks with. Will the Avatar’s reasoning and discovery of patterns help him find the influencer and prevent the war? Well, I can tell you, this book actually has a plot. Hurray! This book was definitely worth the read and a good sequel to “God’s Debris”. 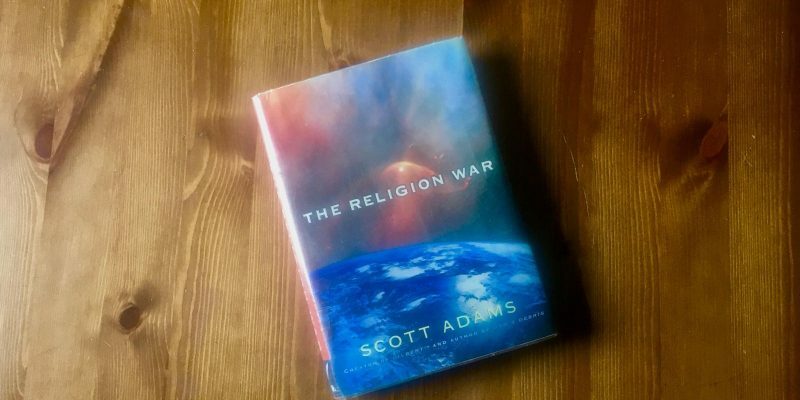 The Religion War is not as mind-blowing as the first book, but it definitely explores interesting ideas and big questions. The book is filled with insights that dare you to think differently. It is amazing how the author succeeds in shaking up the way you think, even though it is fiction. I feel like everyone should read both the books, as they are thought-provoking. The Religion War was a fast, brilliant read filled with thought-provoking philosophies that sound very plausible. I wish there were more books like “God’s Debris” and “The Religion War” because I really enjoy the philosophical and fast format. I read some reviews that claimed there were a lot of holes in Adams’s theories. That may be true, but it does not claim to be anything other than fiction. I would recommend everyone to read the books and just enjoy the mind-boggling insights and discuss them with your peers!